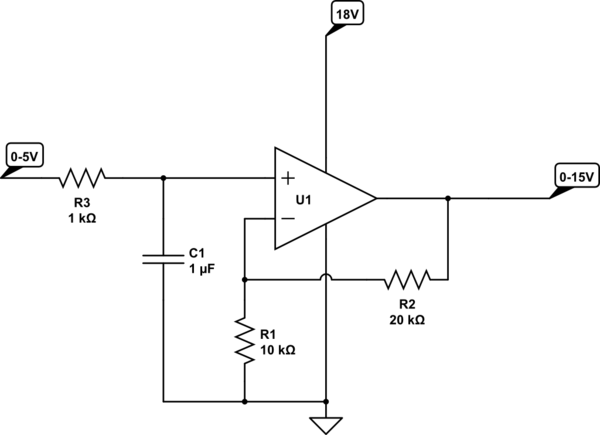 The Arduino cannot directly produce anything more than 5V. You can use PWM and a Low-Pass Filter to produce an analog waveform between 0 and 5V, which you can then amplify using a suitable non-inverting buffer with 3x gain (op-amp), which will boost the voltage to 15V. Whether that is suitable for your needs, though, since the current will generally be quite low (most op-amps have a high output impedance) is unknown. If you want a cleaner waveform you can attach or create a DAC which produces discrete output voltages (again between 0 and 5V) which you then amplify similarly. R3 and C1 form the low-pass filter and should be sized according to the frequency ranges you want to filter and keep. Note that many op-amps that can cope with the higher voltages you need aren't rail-to-rail which means you will have to use a higher power supply voltage than you want to output to leave some headroom. Similarly the 0V will be clipped and will never go below a certain voltage. If you want to get right down to 0V you will need a negative power supply to feed the V- supply of the op-amp (which is currently connected to ground in this schematic). That would allow the output to drop right down to 0V. The Arduino does not have any "analog output pin". There are analog inputs, and you can generate a variable output with PWM pins. Whether the latter meets your needs depends on your (unstated) requirements.